I am taking it due to doctor recommendation. Blood tests indicate that B2 by NOW improves my levels. B-2 100 mg by NOW is excellent, really works for me, got more energy and I'm feeling better every day. B2 deficiency is caused by a lot of artificial light and too much computer use and B12 by NOW helps tired eyes! 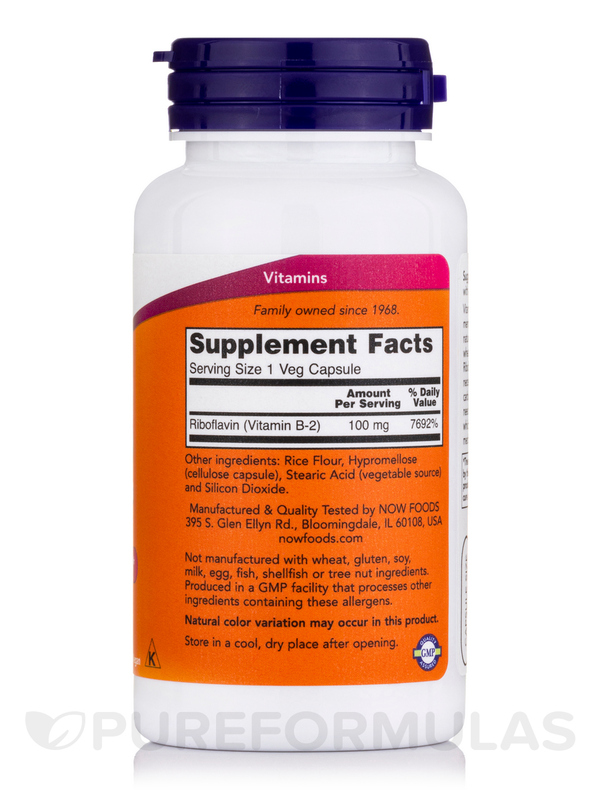 Strengthen your immune system and fight infections with Capsules from NOW® Foods. This dietary supplement may also break down carbohydrates‚ fats‚ and proteins in your body and boost energy levels. Vitamin B2‚ or riboflavin‚ reportedly reduces the harm caused by free radicals to the cells of your body and slows the aging process. This water-soluble vitamin could potentially promote iron metabolism and increase blood hemoglobin levels. 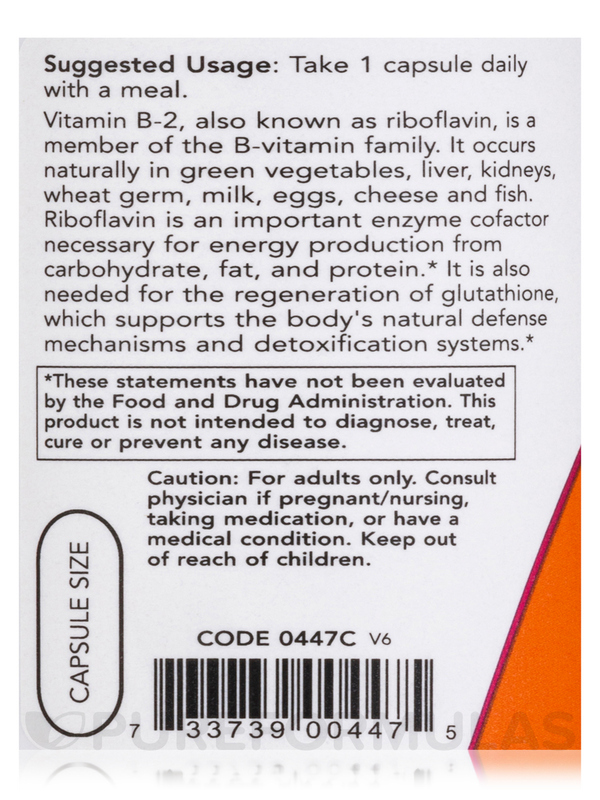 Vitamin B2 in this dietary supplement from NOW® Foods may also restrict the multiplication of harmful cells in your body‚ and inhibit associated conditions. Vitamin B2 may relieve headaches‚ increase energy‚ and support heart health. It may also aid proper development of the connective tissues‚ skin‚ nervous system‚ and reproductive organs. Vitamin B2 reportedly regulates thyroid activity and alleviates joint discomfort. Making B-2 Capsules from NOW® Foods a part of your daily diet could potentially maintain healthy lining of the digestive tract‚ reduce fatigue‚ and prevent memory loss. 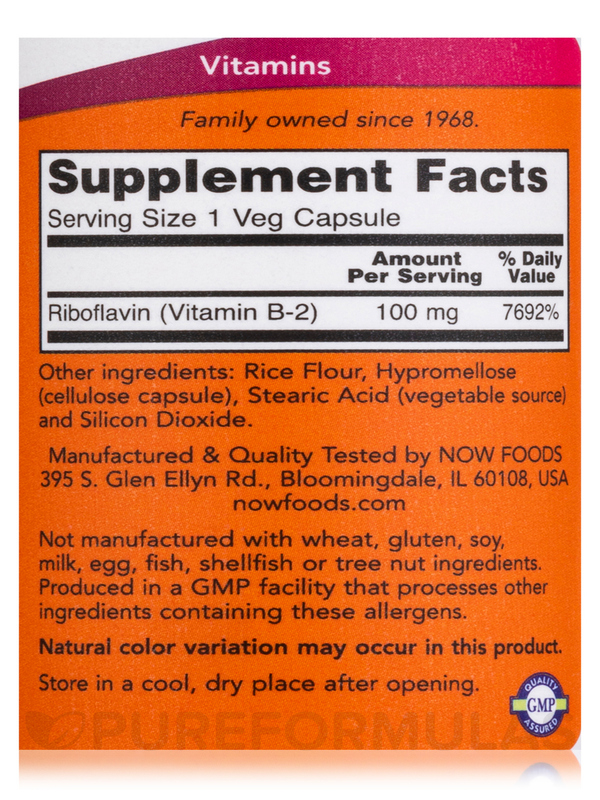 Other Ingredients: Rice flour‚ gelatin (capsule)‚ magnesium stearate (vegetable source) and silica. I can't really vouch for the quality of B-2 by NOW without fancy lab testing, but they seem alright. 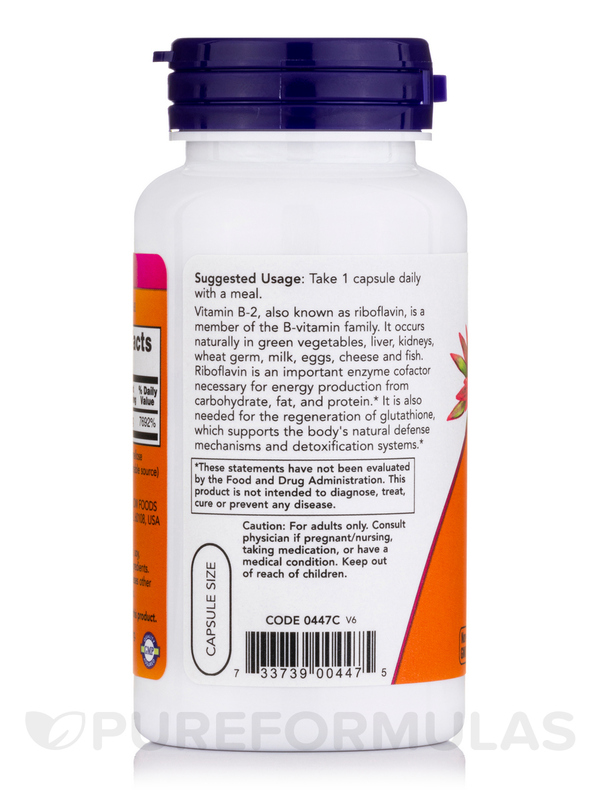 I haven't noticed much of a change in my health (I thought maybe some extra riboflavin would help my eyes be less sensitive to bright light), but B-vitamins are always good for you, right? This B-2 100 mg by NOW is a very important co-factor for many functions in your system. It helps enzymes in your methylation and is at a great price. An OAT test revealed that my ASD child was B2 deficient. We added B-2 100 mg by NOW to his protocol in the morning. It corrected the deficiency. Great price. No bad taste (even for the young child who has to chew this tablet who take it mixed with apple sauce). Taking B-2 100 mg by NOW has given me more energy and leaves me feeling less tired. Helps tired eyes. Clearer vision. 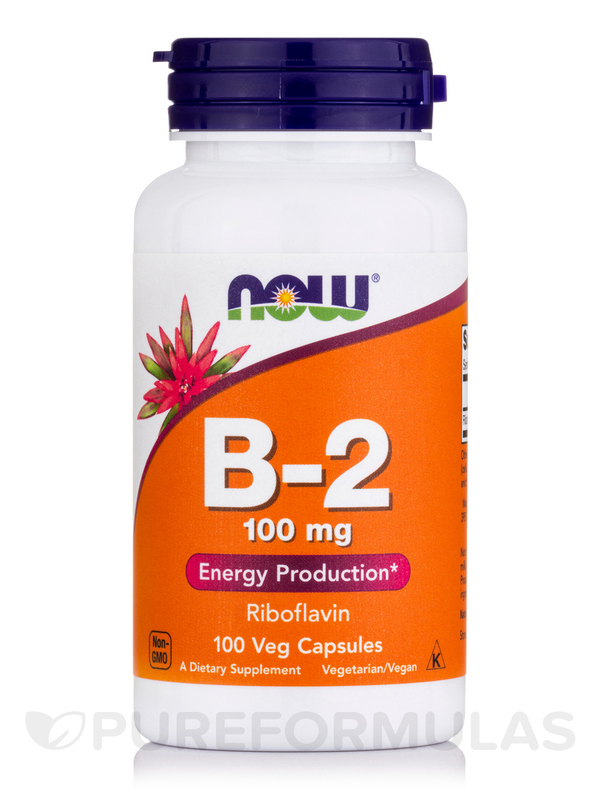 I am taking B-2 by NOW as well as vitamin b3- helps to stimulate the NADHP system to produce adequate amounts of h202. It helps to stimulate atp production. Give energy. Take this while supplementing with Iodine. Great to have. Yes! Easy to swallow, not taste. B-2 by NOW Foods is easy to take and has few other ingredients in it - nice for allergy issues. I sourced it individually as a part of a b-vitamin protocol, and it's working out very well. Does this contain any soy? Hi MaryAnn, thank you for choosing Pureformulas.com! This B-2 100 mg product does not contain any soy. Hope this helps. Have a happy and healthy day! Does Vitamin B-2 help and/or prevent migraine headaches? Hi there Marsha! To answer your question, Vitamin B2 may relieve headaches, increase energy, and support heart health. This product of Vitamin B2? or riboflavin reportedly reduces the harm caused by free radicals to the cells of your body and slows the ageing process. This water-soluble vitamin could potentially promote iron metabolism and increase blood haemoglobin levels. Vitamin B2 in this dietary supplement from NOW Foods may also restrict the multiplication of harmful cells in your body, and inhibit associated conditions.